Another gem from Skrowaczewski’s Indian summer. Over the last four or five years, this nonagenarian conductor has been appearing regularly with European orchestras, giving superlative performances of Bruckner symphonies, and this one, with the London Philharmonic in March 2014 was no exception. Skrowaczewski is a Brucknerian in the mould of Günther Wand. Both conductors avoid bombast, yet achieve the scale and drama required by other means. A lot of the playing here is light, and much of it is surprisingly fast. Yet nothing is ever trivial. Skrowaczewski’s tempos are varied, but his rubato is minimal (a difference there, perhaps, with Wand). So phases are left to unfold at their own pace without continuous adjustment. Instead, Skrowaczewski makes his interventions between phrases, often applying sudden if slight tempo changes. His structural thinking is impeccable – all tempo relations are perfectly judged – yet he is able to maintain a feeling of unpredictability, and even spontaneity, that prevents his Bruckner from ever seeming formulaic. “This evening’s Third Symphony was … distinctive, often surprising, and utterly unique. Listening to the recording is a slightly different experience. Perhaps I was too much in awe of the great man to notice some occasional intonation problems in the strings (only slight in any case). These come through because of the analytical quality of the sound, partly a product of the dry Festival Hall acoustic. The brass sound somewhat thin, which again may be from the combination of the acoustic and the recording, as it wasn’t apparent live. 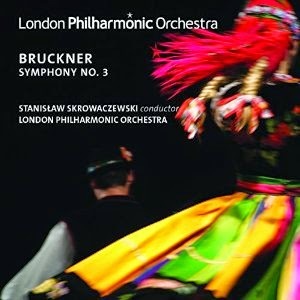 That dry sound isn’t usually ideal for Bruckner, but it fits with Skrowaczewski’s approach, his neat phrasing and often swift tempos. There is some confusion about the edition being used here. The CD inlay tells us it is Skrowaczewski’s own unpublished edition, while the concert programme was equally emphatic that it was Nowak’s edition of the 1889 version. If it is the conductor’s own version, it is clearly based very closely on the 1889 Nowak, but it would be interesting to hear from him what changes he has made, and why. I understand that two documentaries about him are currently in production, so we may get our chance then. In the mean time, the conductor himself is as busy as ever. He returns in the autumn to perform Bruckner’s Fifth with the London Philharmonic. That should be something really special.